With this flavorful, irresistible curried chicken meal, your whole family will be licking their fingers… and their thumbs. Craving Italian? 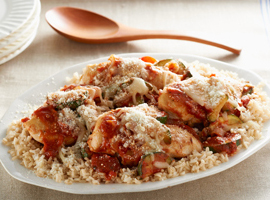 Fire up the skillet for this healthy Rustic Italian Chicken. Top it on a bed of brown rice… and add some red peppers and zucchini to boot. With this healthy dinner recipe, you can use wagon wheel pasta (AKA rotelle), penne, farfalle, rigatoni… the pasta-bilities are endless. Get your protein with this profoundly delicious Vegetarian Chili. With tofu, black beans, kidney beans, onion, tomatoes and spices, this chili is chil-easy to make and easier to eat. In a fix deciding what to fix for dinner? Try this inexpensive, incredibly healthy dish! With onion, brown rice, spinach and grape tomatoes, this risotto recipe is sooo good.